This week the wonderful Jewel is hosting a pop up sew a long over on the Sew Alongs & Sewing Contests Facebook Page to encourage us to finish up some UFO’s (Un Finished Objects, aka abandoned projects). Her enthusiasm is infectious and my 3rd finished UFO this week is this Jalie 3132 . Scuse the wet hair, this was a rather rushed “while you’re on your way to work could you just take a pic of this” photo shoot this morning, the reason being so that I could take it with me to a coffee date to donate to a friend. This top is just too tight for my liking (see concertina effect on my inner elbow). Yes, I can wear it, but I don’t find it comfy or flattering and rather than keeping it in the hope it’ll fit better at some stage in the future, or to wear as a base layer, I’m liberating it so that it can find a forever home where it is loved and appreciated. I got this fabric about 2 and a half years ago on a tourist visit to Guthrie and Ghani thinking I’d make something for my then 6 year old with it, but when I got the pattern from Katrin in a CSC sewing swap I decided to use it for that instead. I got as far as tracing the pattern and doing a FBA but only cut out the back. The reason being that this fabric is thin and shifty and I was struggling to match the stripes up. Well, this week I commenced Operation Lower Your Standards and Get On With It and the top was duly cut out. The make itself was fairly straight forward, I even managed the binding on the V neck as per the instructions without any tears. With such a big gap between tracing the pattern and doing most of the cutting out and sewing up, I can’t really comment on if the sizing issue was my fault in choosing the wrong size, the pattern drafting, or my shape changing in the meantime. The pattern came together nicely and had a sensible amount of notches for matching up. It’s drafted with a 2″ hem, wider than the markings on my sewing machine, so I had to use masking tape to help me line it up for sewing! The sleeve is cut on the fold, which is slightly unusual and I must admit as someone used to asymmetric sleeves I’m a little skeptical that this is the best way to go. My main conclusion about this top is that pretty as it is, I don’t like working with this fabric. It’s a bit see through and not that fun to work with. However, I think it’s made up into a lovely top and I hope it gets lots of wear with my friend. Hello Goodbye it is then. UPDATE: We’re on. So if you want in, let me know your details, either in comments below or via the new Facebook group. Let me know by 22nd July, then I will send out swap partners and contact details so that people can exchange items by the beginning of August. There won’t be a deadline as such, but I’ll do a round up at the end of August (or maybe the beginning of September, cos, bank holidays and festivals!). Well, today is 12th night, time to put all that Christmas stuff away. The Man and the Girl sorted out all the decorations on Sunday, but we still have piles of everyones booty in the living room and it really is time to put those away! (Hmm, I’m worried that that use of booty, as in bounty/treasure won’t read so well to anyone from the US). Most of the stuff is the kids of course, but I have a small pile and I realised I didn’t tell you about the amazing stuffed padda bag on it. Back in December I signed up for the Curvy sewing collective holiday sewing swap (which has a cute little blog button that I’m darned if I can get to work). This was my first time doing something like this and I didn’t realise until I went to pick the present how nerve wrecking shopping for a total stranger would be. Also, I was paired with Katrin, which meant I had slightly less time (as my parcel had to reach Germany) and she doesn’t have a blog (yet) so I don’t even know what she looks like. Neither of these were a problem but it did make chosing slightly more nerve wracking. Luckily we had a really helpful email exchange and I found out that she likes sewing retro style skirts and dresses. Which threw me, as I don’t think I’ve ever made anything retro and I don’t tend to wear or make skirts and dresses (I’m not counting my moss mini skirts, which I really use as a top extension so I can get away with wearing leggings outside, likewise my tunic dresses which are really long t shirts 😉 ). After a bit of pondering I decided to get her the Jenna cardigan from Muse patterns which has a retro feel and would surely go well with some retro dresses and skirts. It has a wide size range (upto 48″ bust) and it got a good review from Sophie Lee. The only down side is that the pattern is pdf, so I emailed Kat at Muse and checked she was happy for me to download it and then send it to someone else and she was fine with that, so I bought it, burned it onto a CD and printed out a little cover with the cardy illustration front. The pattern used up nearly all of my $15USD budget, so I got a little creative to make it more interesting. (Admission time, I did buy a twin needle to go in the parcel, but I had relatives staying and it got lost somewhere in the chaos and I didn’t want to miss the last posting date for EU parcels). I dug out some retro style buttons that had come from my grandmother-in-law’s stash. There are some green rectangular ones (at the top) that I thought might work well on a cardy (but don’t tell the Boy, he’s had his eye on those) and a larger amount of grey one’s (at the bottom, they look pink in this photo but they aren’t) with a petal pattern carved (?) into them that I thought might look nice on a shirt dress (it’s so hard to pick when you don’t even know what colours someone wears). I also put 3 shiny cream (fake ivory style?) square ones with truncated corners and some groves in them, I’ve no idea what they could be used for but they were cool. Then I rudely sewed in front of my relatives and knocked up a quick bag out of scraps and using a retro ribbon from the same stash as a strap (lines with some satin binding as it had lots of floaty bits on the back). Katrin’s clearly been reading my blog as she got me a t shirt pattern: Jaille 3132. I haven’t used any Jaille patterns before so that will be interesting and it’s nice to have another t shirt pattern to try -I don’t think I could justify paying for one when the Birgitte fits so well, but this was a gift. Plus it has a hood. (It also has nursing options but I don’t need those). 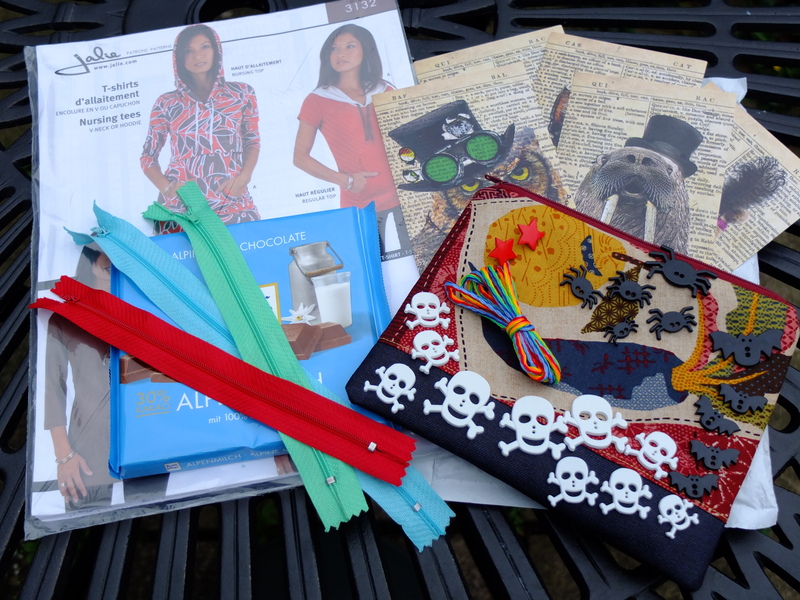 Then there was chocolate (why oh why did it not occur to me to include non sewing gifts) and some really cool steam punk postcards. 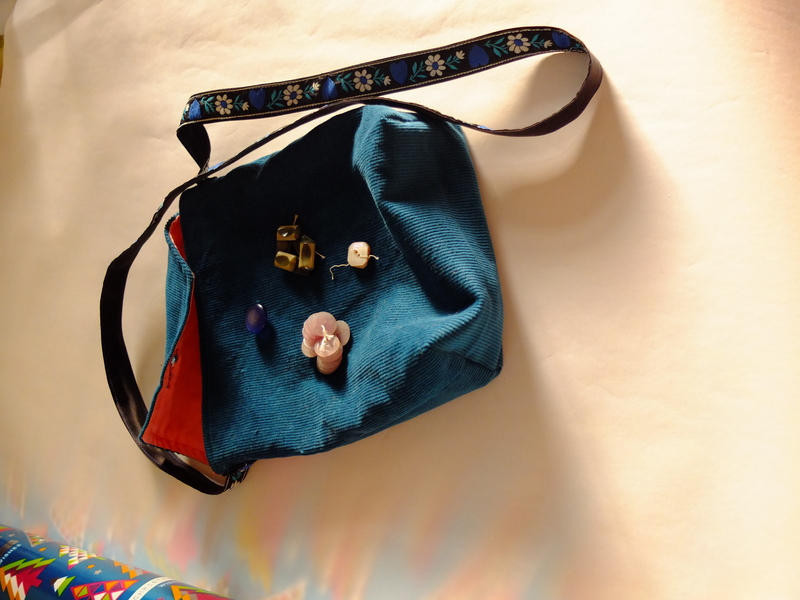 Plus a beautiful zippered pouch with 3 zips, some rainbow cord and some really fun buttons that I’m sure the kids will love (but I may keep the red stars for me). I was bowled over by the amount of stuff and felt a little guilty as I think this is much more inventive that my present. I just hope Jallie patterns are cheap (don’t tell me, I’d rather not know). So thanks to Tanya for organising this and thanks to Katrin for the amazing gift.